This article was originally written for Media Center Edition 2005 for the Microsoft Windows XP Expert Zone Community. With the launch of Windows 7, Microsoft is apparently retiring the older content. The information below has been useful to users of all versions of Windows Media Center and while the interface is slightly changed between different versions, you can use the steps below for assistance even if you are using Vista or Windows 7. So, what can you do with two tuners? You can watch one show on live TV and simultaneously record a different show on another channel. Or you can record two shows at the same time (or two that overlap with different starting and/or ending times). Dual tuner support encompasses watching live TV using a Media Center Extender device while another family member is watching live TV on the host MCE 2005 machine (or while recording a different show on the host MCE 2005 machine). Dual tuner usage in MCE 2005 requires both TV provider sources (channel lineups) to be identical. 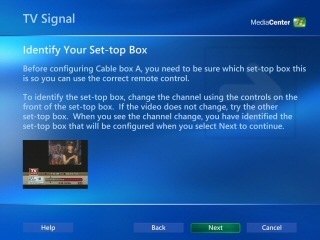 For example, you can configure two set top boxes (STB’s) or two cable out of the wall connections, but you cannot use one set top box and one out of the wall cable connection or one satellite and one antenna connection. The reason for this is pretty simple. Windows XP Media Center 2005 utilizes a single program guide source and uses the “first available tuner” to complete each task that requires a TV tuner. The rules for Windows 7 tuners really have not changed that much and are listed here. Tip: If you have two different set top box models from the same provider, you can use them as long as they both receive the same programs on the same channels. For example, you can use a Motorola/General Instruments DCT5100 and DCT6200 set top boxes to configure dual tuner support. All Media Center computers from major computer makers such as Hewlett Packard, Gateway, ViewSonic, etc. included a single TV tuner card in previous versions of MCE. Media Center 2005 computer models and beyond may include single tuners or dual tuners and in some cases, no tuners. To help insure that any additional add-on hardware not originally supplied with Media Center Edition computers is compatible, Microsoft opened a Designed for Windows XP Media Center Edition Logo Partner List web site and the Windows Logo’d hardware site. If you are adding a second tuner, be sure to select hardware that is certified. I have been using MCE 2005 on a Gateway 901x Media Center pc which, like many other MCE computers, has no expansion slots. And like computers from several other manufacturers, it has only a single IR (infra red) receiver built into the computer chassis that supports only a single IR emitter. The IR emitter is required to control the STB (set top box) from your cable or satellite provider. If you have two STB’s, you would need two emitters. Adding a USB external tuner is easy for most people and can be done in a very short amount of time. Microsoft supplied me with a Hauppauge WinTV USB 2.0 tuner and provided (beta) MCE2005 compatible drivers. External USB TV tuners are externally powered, so in addition to an available USB slot, you’ll need an available AC power outlet or socket on your surge protector. A different option for advanced users proficient in adding and removing internal pc expansion cards is to install an internal PCI tuner. This will involve removing the computer case and in cases where there is no PCI slot, removing an existing card, such as the internal modem card. (This won’t be an option if you are a dialup user and no free PCI slot is available). Again, be sure to select a TV tuner from the Logo Partner List web site. I’ve also tested a two internal tuner configuration on the Gateway 901x by removing the internal modem card and installing a second internal PCI TV tuner. Power off your Media Center computer and all peripherals. Windows XP should automatically discover your new hardware. When prompted, insert the driver CD in your CD drive and let Window’s Plug and Play install your new hardware or follow the manufacturer’s steps to install drivers. When completed, power off your computer and connect the cables and emitters to your STB’s. If you are using dual set top boxes, you will need to use two IR emitters to enable MCE 2005 to change the channels. One end of each emitter is inserted in a port on the IR receiver; the other is placed over the IR window on each STB. If your Media Center Computer included an external USB receiver, you may already have hardware that supports a second IR blaster. For example, the first generation Media Center computers from Hewlett Packard, such as the HP 873n, shipped with an external USB IR receiver that can control two STB’s. Other computers, such as the Gateway 901x, are equipped with only a single internal chassis based IR receiver. Microsoft has engineered MCE 2005 so that an external USB IR receiver that supports dual tuners can be transparently added to any Media Center computer, whether or not an internal IR receiver is present. If you need a new USB IR receiver to use dual IR emitters, you may be able to purchase a kit from Newegg.com or eBay. You’ll receive the IR receiver, the IR emitter cable, and a Media Center remote control. If you already have an IR receiver that supports dual emitters and can’t find an IR emitter cable locally, SmartHome offers several IR emitters on their web site. When you have all the required hardware, setup the IR receiver. If you have an emitter cable plugged into an internal chassis based IR receiver, remove it and plug it into the external IR receiver. Plug the emitter cable for the second STB into the second port in the IR receiver. Attach the other end of the emitter to the STB by placing it over the IR window (use a flashlight to find this). Verify that the second STB is connected to the second tuner using the proper cabling. Once you have all the hardware installed and connected, you’ll need to spend about 15 -30 minutes configuring or reconfiguring your Media Center 2005 computer. Don’t be daunted by the large number of individual steps outlined below. If you follow them carefully, configuration will be easy. From the Media Center menu, select Settings, TV, Set Up TV Signal. Acknowledge the region. Windows checks each of your signals automatically and compares them. A confirmation is displayed confirming that two cable STB’s were successfully detected. Verify again that both STB’s are set on channels that you know you can receive. (For best results, don’t select the same channel on both). If you’ve previously configured your system (for example, configured with a single tuner) a window will display with choices for modifying channel change settings or reconfiguring all set top box settings. Select Reconfigure all set top box settings. To identify the first STB (Cable Box A in the wizard as shown below), use the controls on the set top box itself (not the remote) to change the channel up or down. 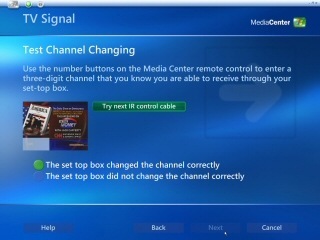 Try the other STB if the channel does not change in the Media Center inset window. a. When prompted, press and hold 0 on the set top box remote (not the Media Center remote control). Tip: If you are too close to the IR receiver, you may have a problem with the signal being recognized. There is a “sweet spot” approximately 3-7 feet away that is optimum for performing this automatic configuration. b. When prompted, press and hold the Enter button. Important: your STB remote may have both an Enter and OK button. Be sure to use the Enter button. 10. Put down the STB remote and pick up the Media Center remote control. 11. Select the number of digits corresponding to the highest channel you receive. 13. Use the Media Center remote and if your service has 3 digit channels, enter a 3 digital channel number that you know you can receive. 14. 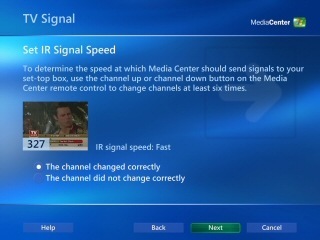 If the channel does not change, select the Try Next IR Emitter button on the Media Center menu as shown in the image below. 15. Verify that the channel changes correctly. You can try several channels you know you receive to be sure, even though you are only prompted to do this once. 16. Determine whether the speed to change channels on the first STB is Fast, Medium, or Slow by pressing the page up/page down keys on the Media Center remote six or more times. Media Center will attempt Fast, Medium, and then Slow as you step through this portion of the wizard. When you are successfully able to change channels, select The channel changed correctly. 17. Next, the wizard assists you in configuring the second TV tuner. To identify the second STB (Cable Box B in the wizard), use the controls on the second set top box itself (not the remote) to change the channel up or down. 18. The wizard guides you through configuring the second STB repeating steps 9-16 above. 19. The final sequence specifies and downloads the Program Guide. You should be connected to the Internet while performing these steps. 20. Select Yes to using the guide and accept the Guide Terms of Service. 21. Enter your zip or postal code. 22. TV signal providers in your area will be displayed. Select your provider. 23. The Program Guide for 14 days will download. This can take up to 20 minutes. You’ll be notified when complete. For additional assistance, I recommend you visit the forums on http://thegreenbutton.com. This entry was posted in Uncategorized and tagged Windows Media Center. Bookmark the permalink.